So, it’s half term, and we’ve made it through pancake day! I can’t believe how much easier pancake day was this year! We didn’t even need to get the books out this year to work out the carbohydrate content of a plain pancake, we simply guessed between 10 and 20g depending on the pancake size (and my ‘flipping’ skills!) Toppings were easier too, and it was easier to have a variety this year. We didn’t flip out when we found the expected spike of raised levels afterwards as we knew it would come down, so all in all it was a pretty chilled out pancake day! It’s got me thinking how times change. Yesterday brought a totally forgotten about pump change. My daughter and my husband are very confident and easy going with changing their pumps, but even so, pump change is not the nicest thing in this house. Probably mostly because it’s a reminder that two of the bodies in this house will not work without this bit of machinery that briefly flicks a needle into soft skin and leaves a cannula as a channel for the vital insulin to continually be administered. Pump change does not take long, but does require concentration to fill it and apply it correctly and I have to confess, sounds pretty loud and dramatic as the needle goes in. Pump change normally happens without event or fuss, but there is a look of something unsaid, (possibly sadness?) that passes between either parent, or between child and parent at some point. Smiles and normal easy chatter, of course, mask this and eventually solve it and then life carries on again. Normal family life with all its ups and downs, but with T1D tagging along, often like a stroppy toddler, stamping its feet and throwing itself on the floor until it gets it’s own way. Demanding to know carb contents, and requiring, (often irrationally), copious amounts of extra glucose or insulin, finger prick tests, and 1-1 attention generally, day and night. Once it has the attention though, it’s happy to tag along quietly. Just before Valentines Day, after T1D had been throwing a tantrum lasting a few days, where blood sugars were simply not rational, or listening to reason, I was feeling particularly tired. There was talk in our house about cards and presents for significant others and I had a mild panic as I realised that I was running out of time to get a card for my husband. Finding the energy to get to the shops seemed impossible and I started to think about how our lives had changed. I miss sleep! I miss dishing up a dinner and not thinking about the carb content. I miss watching (or joining in with) a water fight, without almost absent mindedly reaching for glucose. T1D never stops demanding that attention. But I also have seen other changes, I have seen my older son quietly look out for his little sister with well timed glucose stored in his pocket without prompting. I have seen family and friends, quietly check a packet of biscuits or sweets and as they are offering them around and mention the carb number to me, or my daughter, almost unheard and unnoticed. I have seen teachers encourage and build confidence with physical activity days. I have even seen our bunny sit, not moving, (not even for one of his treats!) and cuddle my daughter for hours until his ‘mummy’ is feeling better. And the other day I found a gift outside my bedroom door. 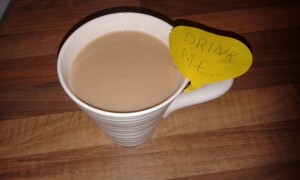 It was a cup of tea in my favourite mug with a note in my daughters handwriting, that simply said ‘Drink Me’. T1D may be a stroppy toddler, demanding attention all the time, but this last week, it has reminded me that time does indeed bring changes, and people will usually pull together, showing love in a way that might not otherwise be noticed. So today, as I request yet more insulin and test strips from the GP, and write glucotabs on the shopping list again, I will say a weird, and of course reluctant, kind of thank you to T1D, for the quieter moments of course, but really for the glucose in my sons pocket, and for my cup of tea.